Journeying with a travel companion or going it alone can be the most important decision of a trip. I've done them both, and each has advantages and disadvantages. Traveling with others provides safety in numbers. A tour takes care of the details. When sickness comes or an accident happens, there is help right at hand. Sharing a sunset, a moment with others, is golden. Yet getting the wrong travel buddy can make for a trip- and friendship-wrecking experience. Finding the right person is pure magic. The disadvantage with traveling with others is that there is an automatic barrier to the places and people you're visiting. One misses a lot by not being available to strangers. The disadvantage of being alone is not sharing the adventure, the vistas, and the problems with a travel companion. Traveling as a couple is the best of all worlds. You are not traveling alone, yet you are still surrounded by the world. Locals deal very well with couples. You are easily invited to dinners and homes without the risks of being solo. Everyone loves a lover, especially a couple in love. Traveling alone can be easier, since I can do things at my own pace. I meet lots of people on the road. So there is no trouble at all to find a travel companion. It is easier to travel with, when and where I want. Or better yet, arrange to meet somebody from home in a foreign land. What a great feeling it is to see an old friend on the road. 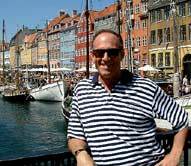 Here is my friend Dan that I arrange to meet in Copenhagen, Denmark, with big smiles all around! A year later, we take a three week motorcycle trip together through Sardinia, Corsica and the mighty Alps. Tell everyone you know that you are looking for a travel companion. Be picky. Travel is hard work and can destroy friendships. Try an online travel service like Travel Chums or Find a Travel Companion. Try travel friendship sites that take trips around the world and stay almost exclusively with the locals such as Friendship Force. Try traveling alone using Solo Travel Site and find someone on the road to travel with. I do this with great results. For example, I've traveled with New Zealanders in China, Japanese in Spain, and Canadians in Northern Ireland. The combinations and possibilities are endless. One of the best ways to meet people is at Youth Hostels. They accept people of all ages, outside of Bavaria, Germany. They are favorite setting off points from major entry cities around the world. Go on a short journey for an afternoon or a weekend with a perspective travel partner. You'll find out very quickly if you are compatible. Take turns taking the lead. Be a good follower as well as a good partner. Full of problems. Full of solutions. Go to the Library Travel Section.